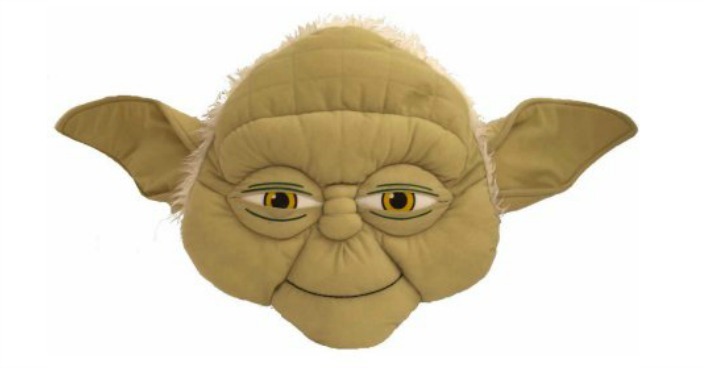 Star Wars Episode VII Yoda Face Pillow Just $8! Down From $15! You are here: Home / Great Deals / Star Wars Episode VII Yoda Face Pillow Just $8! Down From $15! Right now you can get this Star Wars Episode VII Yoda Face Pillow for just $8 (Reg. $15) at Walmart! The Star Wars VII Face Pillow is ideal for fans of all ages. Little ones will find a friendly companion in their favorite character that they can play with, sleep with or have fun and recreate their favorite scenes from the movie. Older kids and adults can build a collection and get all four characters, including R2D2, Yoda, Stormtrooper and Darth Vader. This face pillow is made of soft and comfy polyester with ornate details and comes in bright, vibrant colors.